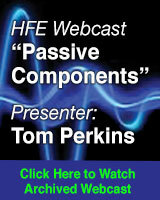 RF and microwave engineers are today confronted by a range of challenges. One such challenge is having to deal with IC and RF board-level design requirements that must be met in small footprint, highly dense packages. What makes this so difficult is that proximity and coupling effects within the IC and RF board alter their performance, which in turn can lead to design failures. As a result, predicting these coupling effects on a design and appropriately tuning it to meet specifications prior to tape-out and fabrication has now become absolutely essential. There is a way to accomplish this task today using electromagnetic (EM) simulation; however, the approach can be quite tedious. First, the designer has to remove all actives devices and Surface-Mount Device (SMD) components from the board, assign and place ports and perform EM simulation. Then, Look-Alike components are created and inserted into the schematic. Finally, the active devices and SMD components are put back, reconnected and the EM model is used to simulate the whole design. It’s easy to understand why this traditional approach might be deemed laborious and time consuming, especially if there were hundreds or even thousands of components on the board in question. Tuning such a large device count circuit would require many steps and mouse clicks, significantly slowing the overall process. Step 1. Create a Top-Level Schematic page from which the view to be simulated (circuit versus EM) is selected. Step 2. 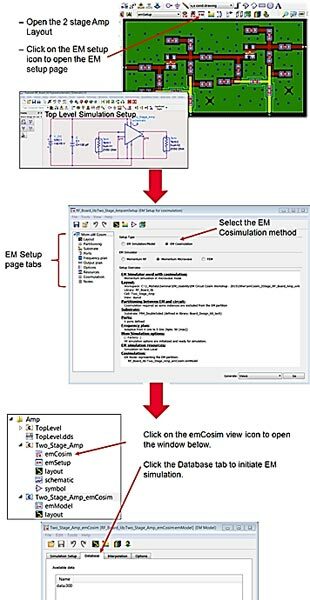 From the EM Setup page, select the EM Cosimulation (emCosim) method. An emCosim view is automatically generated. Step 3. Launch ADS Momentum and perform the EM simulation. Step 4. Select the desired view, layout versus emCosim, for simulation from the Top-Level Schematic page. Plot the results in the data display. While each of these steps is fairly self-explanatory, it’s useful to walk through the process with a real-world example; in this case, a two-stage RF amplifier board (Figure 1). To begin, the designer must first open the two-stage RF amplifier layout in ADS. Then, click on the EM Setup icon to open the EM Setup page. Once on this page, the designer selects EM Cosimulation under the Setup Type heading (Figure 1). The EM Simulation/Model may also be selected as the Setup Type if the designer wishes to revert back to the more traditional approach. Figure 1 • Shown here is the flow of the first three steps in automatic EM/Circuit partitioning. Assuming EM Cosimulation was selected, the designer must then select Partitioning from the EM Setup page tabs. A partitioning page appears that shows the components (e.g., capacitors, inductors and transistors) and their corresponding partitioning rules. All SMD components will simulate with their circuit models, while the board interconnects will simulate with their EM model. 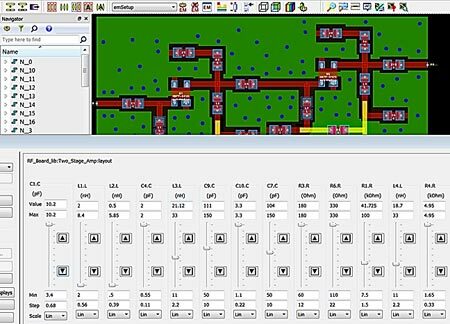 To generate the emCosim view, all the designer has to do is click “Go.” The software automatically generates the view, strips out the components and puts in ports—all without any manual intervention required. With this view, the designer is able to switch views and perform polymorphic simulation, as well as compare the various models (e.g., circuit, layout and EM). Once the view has been automatically created, the designer is brought back to the main ADS window. There are now 3 views of the two-stage amplifier: emCosim models (board EM + SMD circuit models), layout models and schematic circuit models. A new cell has also been automatically created, Two_Stage_Amp_emCosim, to perform EM simulation on the board. In this cell, the SMD components have been automatically removed and ports have been automatically placed for the EM simulation. Figure 2 • Comparing schematic and emCosim views of a two-stage RF amplifier. The next step is to simulate. The designer simply clicks on the emCosim view icon and a window with the Two_Stage_Amp_emCosim cell opens up. The Database tab is then selected, which allows the designer to initiate the EM simulation in Momentum and get the EM model of the board interconnects. The results are automatically saved in the database. Now that the designer has all of the data, the desired view (schematic, layout or emCosim) can be selected and simulated, and the results plotted. Another view can then be selected and the simulation run again. For the two-stage RF amplifier, schematic and emCosim views were selected. Both results are displayed together for comparison purposes, as shown in Figure 2. Here, the amplifier’s response with circuit model components on the schematic and no board EM model is denoted by the red trace. The blue trace shows the amplifier emCosim response with circuit model components and the effects of the board EM model added in. 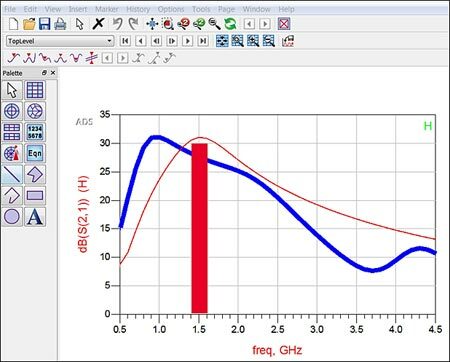 Notice from the plotted date results that the amplifier has a frequency of 1.5 GHz. It has shifted down to 1 GHz in the blue trace as a result of the coupling and EM simulation of the board. 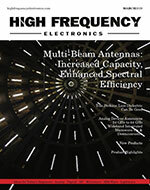 Now the question becomes: How exactly does the designer go about tuning the frequency back to 1.5 GHz? 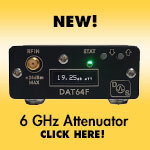 Figure 3 • The two-stage RF amplifier can be quickly and easily tuned from the Layout page. To bring the response back, the Tune mode is launched from the Layout page. The designer then dynamically tunes each SMD component value, along with the board EM model, up and down until it meets specification (Figure 3). The board can also be tuned from the Schematic page. To do this, an EM COSIMULATION controller must be added on the two-stage RF amplifier Schematic page. This allows the board Interconnects EM model to be included with the circuit simulation. Without a doubt, predicting coupling effects on a design and appropriately tuning its performance to compensate for these effects has traditionally been a manual and sometimes arduous task. The use of new techniques like the ADS EM/Circuit partitioning and Cosimulation are now providing designers with a fully automated and, in turn, much easier alternative. By allowing designers to quickly and effectively tune all SMD components, while including the EM effect of the board layout interconnects and coupling, they are ultimately better able to produce “manufacture-able” designs that meet performance specifications with first pass success. Jack Sifri is a MMIC/Module design flow specialist with Keysight EEsof EDA.